Our Lady Aparecida is always celebrated on October 12th of every year. It honors Brazil's patron saint, the Virgin Mary Aparecida. A huge 10 day festival takes place in her honor at the city near São Paulo that bears her name. The festival has numerous parades, music and dancing so that everyone can have a good time. The holiday is based of a legend about some fishermen that were out of luck in catching any fish. They did one last cast and pulled up a statue of the Virgin Mary to which they cast again and come up with a net full of fish. 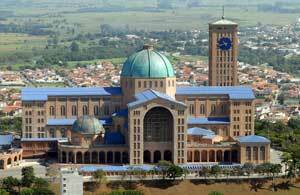 A town a church was formed where the miracle happened and was called Aparecida meaning 'she who has appeared'. Thus causing the need for a celebration.